It's no secret that the college textbook publishing business is in trouble. The declinging economy, student and faculty resistance to high prices of new text books, and the used textbook market are among the factors making life difficult for publishers. Now, according to a NYTimes article, publishers are having their base business attacked by textbook rentals. Chegg.com is a venture back startup that is building a growing business renting textbooks to college students. With demand for good deals on textbooks running high, Chegg’s success comes in large part from being able to address those inefficiencies. While Chegg primarily rents books, it is also essentially acting as a kind of “market maker,” gathering books from sellers at the end of a semester and renting — or sometimes selling — them to other students at the start of a new one. That provides liquidity to the market, said Yannis Bakos, associate professor of management at the Stern School of Business at New York University. Using newspaper headlines and articles, the Global Strategy Institute at the Center for Strategic and International Studies (CSIS) has put together a web site with an explorable map called "Mapping the Future." The map links together what I'd call Events in various categories such as Science, Politics, Construction, and Sporting & Culture arrayed over a time line from 2008 to 2012. Clicking on various Events pops up the article or information underlying the headline. It's unclear what CSIS intends. Event sequences and confluences can be both informative and suggestive as may be the case with this map. At the same time, Event sequences don't constitute in and of themselves a scenario, which should, in my view, be a narrative with plot, actors, motives, Events, etc. leading to a particular integrated vision of a possible future outcome, or Endstate. More information on Endates, Events, and the Scenario Mapping(tm) methodology may be found in this presentation. As noted, my former colleagues at NCRI created a form of scenario planning called Future Mapping that improved upon scenario processes pioneered in the business world by Royal Dutch Shell. I was the founder of a series of public workshops on the the Future of Information Commerce that were held in the early 1990s. After my departure for Silicon Valley, my former colleagues continued the workshop. Thanks to the Wayback Machine, I've been reviewing selected results from a 1997 edition of the workshop. The full original report is here; a presentation (PDF) on the Scenario Mapping(tm) process is here. 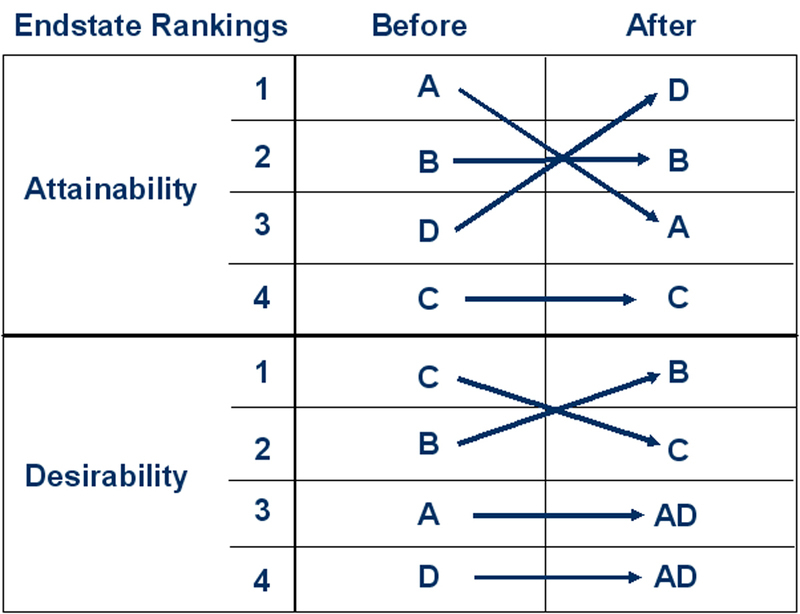 Public workshop participants are asked to rank the Endstates in terms of Desirability and Attainability. Each person is assigned to a team which analyzes their assigned Endstate and then delivers a 15-20 minute presentation that explains how the world got to be that way. Following all the team presentations, participants are asked to re-rank the Endstates. I first met Jim Channon several years ago at the Bamboo restaurant in Hawi, on the north side of the Big Island of Hawaii. Among other things, Jim is one of the 3 pillars of graphic meeting facilitation (with Bob Horn and David Sibbet), environmentalist and futurist, proposer of the Earth First Battalion, and a terrific raconteur. [tip o' the hat to BH] I've been watching Jim's YouTube video, "12 Break-throughs of the Next Decade." In this thought-provoking 10 minute video, Jim suggests some additional / alternative activities that might be undertaken by large companies and institutions for the benefit of humankind. The list of organizations includes armies, banks, chemical and oil companies, navies, churches, governments, space agencies, and colleges. To hear the alternative projects Jim associates with each organization, check out the video. To rewind just a bit, my former colleagues at NCRI created a form of scenario planning called Future Mapping that improved upon scenario processes pioneered in the business world by Royal Dutch Shell. After I had departed for Silicon Valley, they continued a series of public workshops on The Future of Information Commerce. The results are available here via Internet Archive's Wayback Machine. An overview of what I call (for trademark reasons) the Scenario Mapping process is provided in this presentation. Working in teams, workshop participants decide which of 150 plausible Events provided by the facilitators Must or Must Not happen if the team's assigned outcome or Endstate is to be realized. Events that are Common to a majority of scenarios are called Common Events. These are worth added attention because, generally speaking, more industry stakeholders have an interest in these Events. In the 1997 workshop, 12 events appeared in a majority of scenarios. Here they are with my comments. Information Commerce: What People Were Thinking About 10 Years Ago? In 1990-1991, the Association of American Publishers co-sponsored a series of public workshops on Mapping the Future of Publishing that I conducted with my then colleagues at NCRI. Later on, I morphed these public workshops into Mapping the Future of Information Commerce. After I departed NCRI at the end of 1995 my former colleagues ran additional installments of the Information Commerce workshop in 1997. Thanks to the Wayback Machine at the Internet Archive, the report is available on the net here. I thought that it might be a very interesting and possibly useful exercise to return to those days of yesteryear and see what knowledgeable industry participants thought about the future of the information industry and with the benefit of 20/20 hindsight compare their thinking to what actually happened and where we are now. The Future of Information Commerce workshops used a highly interactive scenario planning process that in these pages is called Scenario Mapping. In addition to the discussion in the report itself, an overview of the Scenario Mapping methodology can be found in this presentation. In brief, a Scenario Mapping workshop combines "simulated hindsight" with a highly prepared meeting to leverage the collective intelligence of workshop participants. By simulated hindsight I mean that we assume the future is now and ask how the world got to be this way: what were the key milestones, actors, motives, drivers, etc. that led to this world rather than some other. By highly prepared meeting, I mean that the facilitators in conjunction with workshop sponsors prepare several coherent descriptions of future outcomes or Endstates and a set of hypothetical Events. Each Event has a headline, date, and brief description. In this series of blogicles, I'll provide snapshots of the Endstates used in the 1997 Information Commerce workshop, summaries of the deliberations, and report on how participants voted on the Endstates and Events. I'll also focus on the "compares and contrasts" with the present. I've been attending conferences on Cold Fusion (also called Low Energy Nuclear Reactions and Lattice Assisted Nuclear Reactions) since the 10th International Conference (ICCF10) held in Cambridge, MA in 2003. Wired online has published an article by Mark Anderson providing a very high level overview of last weekend's 2007 LANR (CF) Colloquium at MIT hosted by MIT Professor Peter Hagelstein and Dr. Mitchell Swartz of JET Thermal Products and Cold Fusion Times. I'm quoted towards the end of Anderson's article. Google. In our "GOOD" scenario, revenue growth merely slows--to 20% a year. (Google fans will argue that Google's growth won't slow at all because advertisers have perfect visibility into ROI, half of the business is international, etc. There are counter-arguments to each of these points, but you can make your own assumptions). Expense growth in this case also slows to 20%. Google is a supertanker whose expenses are currently growing more than 65% per year, so slowing expenses this much would be very "GOOD." In any case, in this scenario, Google's margins hold and operating profits grow 20%--nice, but short of what Wall Street is probably expecting. In our "BAD" Google scenario, revenue flattens, and the company reigns in expense growth to 10% year (heroic). In this case, revenue stays the same, but the operating margin drops from 29% to 21% and operating profit drops by a third. (Imagine how Wall Street will react to that). We won't tell you about the UGLY case--you can see for yourself. As some readers know, the Big Island of Hawai'i is at the top of my favorite places list. Vision Foresight Strategy, a strategy consultancy based in Hawaii, has developed four scenarios for the future of that state that apparently will inform a 2-day conference this fall, the Hawai'i Futures Summit: Shaping Change. While change on the level showcased in these scenarios happens because of many different trends and events in society, using one sector to frame each scenario allows us to consider a particular angle or ‘take’ on those factors that shape Hawai‘i’s futures. Despite this framing, factors from many areas, and from different levels, were taken into account when we created the scenarios. It is important to remember that these scenarios are not predictions, but rather exercises in exploring how and why Hawai‘i may change. Each scenario stresses a different sector: Social, Economic, Environmental, and Political. “Cultural Fragmentation” (Social): The myth of the melting pot is exposed. “Towers of Tomorrow” (Economic) Population growth and urbanization reshape Hawai‘i. “Rising Tides” (Environmental) Accelerated symptoms of climate change drive Hawai‘i. “Launching Point” (Political) Hawai‘i as the forward base in the era of American Engagement. In graduate school many years ago, I worked with a professor from Canada who believed that eventually the United States would consider annexing some or all of Canada in order to gain access to that country's water resources. Anything is possible. TERI-BCSD (Business Council for Sustainable Development) India in association with the Bombay Chamber of Commerce and Industry & The Leela Group of Palaces, Hotels and Resorts is organising a national workshop on Water Scenarios for Indian Businesses on 05 June 2007 (World Environment Day) at The Leela Kempinski, Mumbai. Mr. SM Krishna, Honb’le Governor of Maharashtra will be the chief guest and will deliver a special address. In the National Water Policy and several state policies water allocation to industry is at the bottom of the priority list. Keeping this in view, sustained supply of freshwater becomes a critical issue for the survival of many industries especially water-intensive industries. The risk that industry faces today can be measured in terms of situations that have occurred where water stress, measured in terms of both availability and quality, has led to an increase in water costs, growth in business disruption and increased concern among the stakeholders about companies’ water-related performance. BitTorrent and eDonkey are the top P2P networks and half the usage is for TV shows. P2P hogs something like 35% or more of all Internet traffic. Thirty-five percent! But to replace cable, it has to be real time, and there are tons of real time P2P players, especially out of China: TVU, SopCast, PPMate. As I write this, I'm watching ESPN on my PC, denying Disney another outrageous $2.30 per month they charge me via Comcast. Just as the iPod opened up stolen music to the masses, devices like Apple TV mean I can stream to my wide screen. Is this Napster redux? It might well be. TV is no longer the safe cuddly business it once was. Forecast #2: Dwindling supplies of water in China will impact the global economy. With uneven development across China, the most water-intensive industries and densest population are in regions where water is scarcest. The result is higher prices for commodities and goods exported from China, so the costs of resource and environmental mismanagement are transferred to the rest of the world. Forecast #6: Outlook for Asia: China for the short term, India for the long term. By 2025, both countries will be stronger, wealthier, freer, and more stable than they are today, but India's unique assets--such as widespread use of English, a democratic government, and relative transparency of its institutions--make it more economically viable farther out. Forecast #8: The costs of global-warming-related disasters will reach $150 billion per year. The world’s total economic loss from weather-related catastrophes has risen 25% in the last decade. According to the insurance firm Swiss Re, the overall economic costs of catastrophes related to climate change threatens to double to $150 billion per year in a decade. The U.S. insurance industry’s share would be $30-$40 billion annually. However, the size of these estimates also reflects increased growth and higher real-estate prices in coastal communities. Google Video has a fascinating film on the origins of the Internet that should not be missed if you are all interested in the history of the Net. The film by Steven King includes interviews with Bob Kahn, JCR Licklider, BBNer Frank Heart, and several other Internet pioneers. Lauren Weinstein has posted a Windows Media version of the film for direct download here. Rod Van Meter has posted list of those seen in the film but not identified here. Edward Vielmetti has linked the Wikipedia to Van Meter's page here. How should we think about world-changing technologies? This is the question posed and answered by Jamais Cascio in an article on WorldChanging.com. Generally speaking previous answers to this question tend to fall into two camps or philosophies. The first advocates the Precautionary Principle, namely, that "we should err on the side of caution when it comes to developments with uncertain or potentially negative repercussions, even when those developments have demonstrable benefits, too." The second advocates the Proactionary Principle, specifically, that "we should err on the side of action in those same circumstances, unless the potential for harm can be clearly demonstrated and is clearly worse than the benefits of the action." When considering the development or deployment of beneficial technologies with uncertain, but potentially significant, negative results, any decision should be made with a strong bias towards the ability to step back and reverse the decision should harmful outcomes become more likely. The determination of possible harmful results must be grounded in science but recognize the potential for people to use the technology in unintended ways, must include a consideration of benefits lost by choosing not to move forward with the technology, and must address the possibility of serious problems coming from the interaction of the new technology with existing systems and conditions. This consideration of reversibility should not cease upon the initial decision to go forward to hold back, but should be revisited as additional relevant information emerges. All well and good. But some argue that some advanced technologies once deployed cannot be put back in the bottle, so to speak. Are there any historical examples of technologies that were deployed and then recalled? Certain pharmaceuticals have been recalled once pernicious effects were demonstrated. Thalidomide was banned after it was shown that it cause grievous birth defects. The FDA approved thalidomide in 1998, under a restricted access system, for the treatment of erythema nodosum leprosum associated with leprosy (Hansen's disease). It also was found to be effective for multiple myeloma, and is now standard first line therapy for this disease in combination with dexamethasone. So is this an example of revsersability? Probably not. Take the Strategy Kinetics Challenge: Post a comment suggesting a historical example of the reversability principle. What do you get? Just thanks and 15 seconds of fame. I returned home Saturday night to find a copy of condensed matter nuclear science: proceedings of the 10th international conference on cold fusion, edited by Peter L. Hagelstein (MIT) and Scott R. Chubb (Naval Research Laboratory). Weighing in at 4.25 pounds, this is no small book addressing a big big topic. I had attended the 10th ICCF, which was held in Cambridge, and hence a copy of the proceedings showed up on my doorstep. What can be said about cold fusion? First, I'm not a physicist and cannot fully evaluate the science presented in this collection of papers, or elsewhere for that matter. That said, let me report what others say based on many informal interviews during ICCF10 and subsequently. You may remember that in the 1980s, chemists Stanley Pons and Martin Fleischmann created a sensation when they announced they had produced excess energy -- more out than went in -- in a table-top experiment. The source of this excess energy was cold fusion, sometimes referred to as Low Energy Nuclear Reactions ("LENR"). If verified both experimentally and theoretically, cold fusion would be a world changing scientific breakthrough. SCOTLAND could develop into a "dynamic country" with a "bohemian culture" attracting wealthy tourists from the developing nations, or it could become like a third world nation with a few visitors in "gated resorts" catering for high-rollers. An earlier blogical here pointed out Robin Sloan and Matt Thompson's EPIC 2014 video on the future of news, the web, and journalism. Now the video has been updated. The EPIC 2015 video can be found here. Why these issues? In part interest and in part to suggest that the strategy development and implementation tools we frequently use on Strategy Kinetics-led consulting projects are useful in addressing the broadest range of strategic problem areas, including those that are believed to entail exceedingly intractable social messes, such as global climate change or healthcare in the United States and as a global human issue. The UK government's influenza pandemic response plan can be found here [in PDF format]. In 1918/19 the A/H1N1 pandemic occurred in three distinct epidemic waves: early spring 1918, autumn 1918 and late winter 1919. The second wave was by far the largest and case-fatality rates were also higher than in the first wave12. The A/H3N2 pandemic caused an epidemic wave in the winter of 1968/69 but a more severe one in 1969/704. In contrast, the second wave of the 1957/58 pandemic in the UK was very small in comparison to the first3. Thus all planning should assume that more than one wave is possible (but not inevitable) and that a second wave could be worse than the first. In addition to the World Health Organization (WHO) and the Centers for Disease Control and Prevention in the United States, other national governments have developed action plans for responding to the threat posed by the next global influenza pandemic. For example, Canada's plan is overviewed here and presented here. In addition to detection and treatment options, the Canadian plan also includes a section deal with mass fatalities [in PDF format]. Such contingency planning is both prudent and responsible. That the Canadian government has published the plan including provisions for worst case situations is both noteworthy and laudatory. Frank communications build trust between governments and citizens.